Great Yarmouth TownOne of the UK's most popular seaside resorts, Great Yarmouth is Norfolk's premier seaside resort, set in a sunny position on the east coast with Norfolk Broads and beautiful countryside to the north, south and west and 15 miles of stunning sandy beaches stretching along the Great Yarmouth coastline from Winteron-on-Sea in the north to Hopton-on-sea in the south. The sea has played a huge part in shaping Great Yarmouth. The town has the second most complete medieval town wall in England complete with several gate towers and was used to raise taxes on arrival or departure and to keep pirates out altogether. Nelson's monument is a stunning 44m (144 feet) memorial to Norfolk's most famous son, Admiral Lord Horatio Nelson who frequently sailed from the town in the 1800's. Several museums in the town recall Great Yarmouth's maritime past and herring heyday which lasted until the mid 1900's, when Silver Darlings were fished and packed, employing a vast industry of workers, who were housed in Great Yarmouth's famous Rows, unique tightly packed together houses built onto narrow alleyways, with wealthy merchant houses at one end and bars and brothels at the other. The historic quayside plays host to the popular Maritime Festival in September, celebrating the town's maritime past, present and future. In the early 1700's the first tourists came to take the waters at Great Yarmouth as hundreds of visitors flocked to the seaside to stroll along the esplanade and enjoy the warm weather. 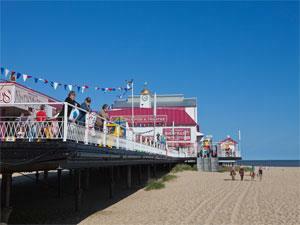 Today, Great Yarmouth's vibrant seafront harks back to the traditions of yesteryear, but remains upbeat, modern and fun, packed with family attractions and entertainment, looking out onto a wide sandy beach stretching from the Pleasure Beach to North Beach, home to Great Yarmouth's only seafront holiday park. Great Yarmouth's golden mile runs between two fun-packed piers, the newly refurbished Wellington Pier with amusements and a state of the art ten pin bowling alley with floor to ceiling windows overlooking the beach and Britannia Pier with traditional end of the pier fun and the Britannia Theatre overlooking the Bowling Greens to the north. 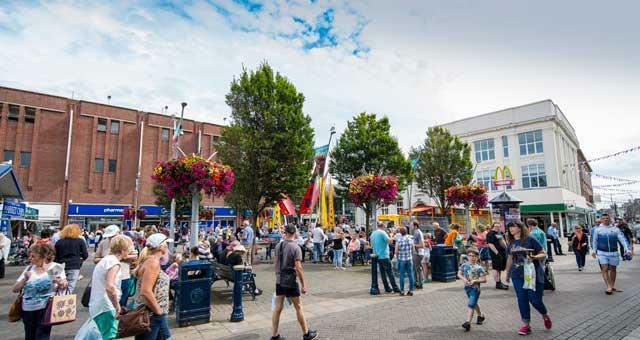 Just a short walk from the seafront through the newly landscaped St. George's Park or along Regent Road under the ceiling of light, Great Yarmouth town centre is home to a range of shops, banks and independent stores, the permanent market and Market Gates shopping centre. Award-winning restaurants and cafés are situated all over the resort, catering to all tastes and pockets, from local seafood to Italian, Thai, Indian and Chinese food, as well as the best of contemporary British cuisine. A number of seafront cafés have outside seating areas where visitors can relax. As the sun goes down, visitors can enjoy nightclubs, casinos, theatre or circus shows and colourful seafront illuminations. Summer Wednesday firework displays run throughout the school summer holidays in July and August when the emphasis is on family fun for everyone. One of the UK's most popular seaside resorts, Great Yarmouth is Norfolk's premier seaside resort, set in a sunny position on the east coast with Norfolk Broads and beautiful countryside to the north, south and west and 15 miles of stunning sandy beaches stretching along the Great Yarmouth coastline from Winteron-on-Sea in the north to Hopton-on-sea in the south.